Cash-strapped Capetonians who stayed home during December may fancy starting the new year with a pamper party. Do it solo or in a gang and pick from half or full day packages. Alternatively, tailor-make your own. Treatments range from exotic Indian to the nature-inspired and dramatic hydrotherapy. Rainbows and stars have always triggered me into an altered state. 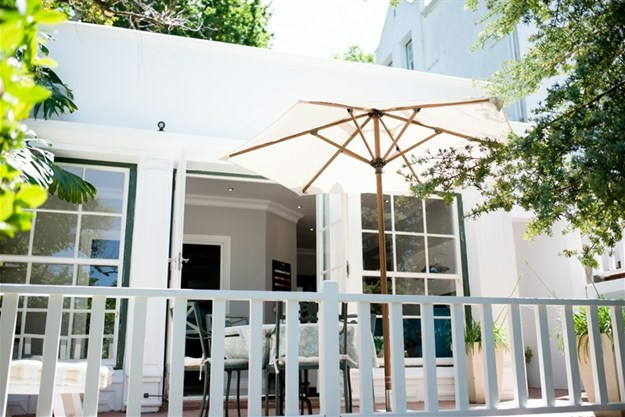 Having a DIY Rasul experience at Stellenbosch’s Lanzerac Spa offers both. Tiny twinkling rainbow lights on the black ceiling imitate the moving night sky in the rasul chamber. I’m mesmerised. 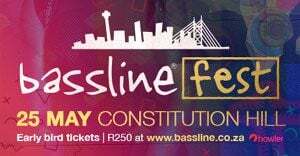 Though the glass of Lanzerac bubbly thrust into my hand could also be responsible for that! With a cool marble slab beneath me, the steam invades my every pore; my thirsty skin satiated by the pleasurable assault. For maximum detoxing, slather the wooden bowls’ clay on your face, hair, and body. My rainbow therapy gets more galactic with the Neoqi ThalasoVine Contouring Envelopment hydrotherapy. Think here the sleep capsules commonly seen in science fiction movies. Claustrophobics: have no concern as your head pokes out of the capsule. 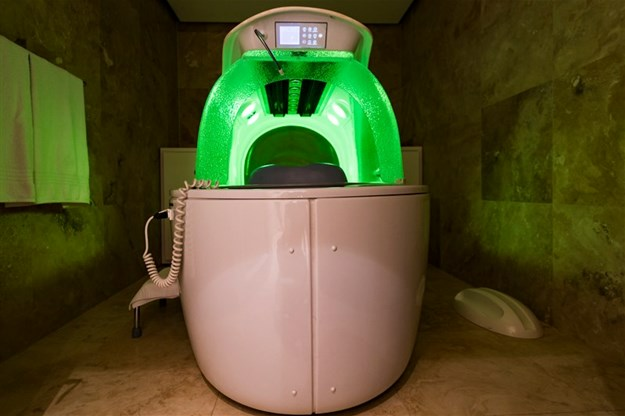 The high-tech capsule’s lowered around you after your therapist-applied exfoliation scrub. Lights and multiple Vichy showers are activated, spraying in every direction in varying temperatures. Synchronised with the body’s chakras (energy centres), changing rainbow lights do a body dance. Colour therapy was a proven healing approach used by ancient civilisations. I’m a perennial heat-seeker due to sluggish circulation. For greater penetration of my seaweed wrap, the capsule’s infrared light session can be described as deliciously warming, constantly. It could have continued forever. Likewise the vibromassage underneath me! A short scalp stimulating pressure point massage brings my treatment to a head. Numerous other Neoqi therapies include the grape-infused sponge soap exfoliation, using red grape skin extract. Uber-modern, the spa’s gym and the indoor pool is a visual dream for fitness freaks. Ceiling-to-floor glass walls have views over vineyards and the surrounding Jonkershoek mountains. Upstairs relaxation stations offer similar views with greater privacy. A magnet for the many romantic weekenders that gravitate to this regionally-popular spa, marriage proposals abound here. Ditto the shared pleasures of the facilities: mist rooms, a steam room, sauna, jacuzzi, and ‘experience’ shower. Hydrotherapy’s left me hungry. A Vitality mushroom wrap and peanut butter smoothie take care of that. In sniffing distance of the vineyards from the deck’s recliners, a welcoming body shot of sprinkler water splashes me on the warm breeze. De-vine treatments aren’t the only attraction here. Every step taken at Fresh Wellness reminds you of where you are. 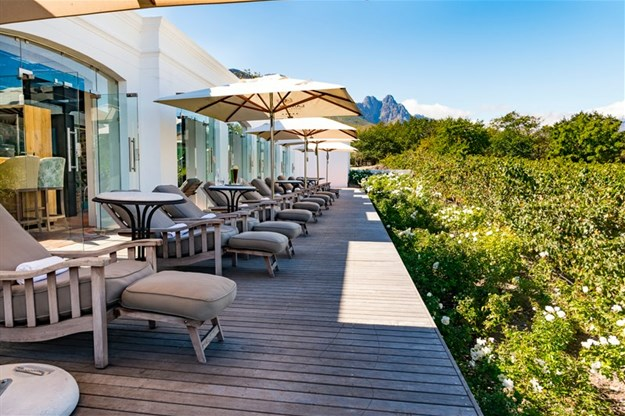 Award-winning spectacular gardens at the Cellars-Hohenhort Hotel surround the spa. Amongst the 13 gardens, there’s the rose, herb, woodlands, fountain, indigenous, and hot gardens. It’s rare, but I’m early. I sip on lemongrass tea, feasting on the natural world’s delights a stone’s throw away. 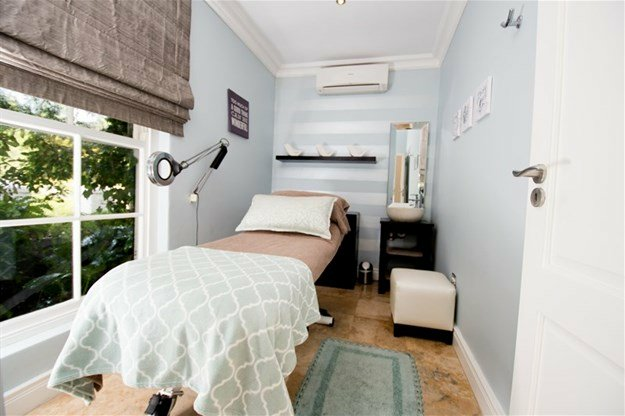 A lengthy treatment menu here includes eyelash extensions, waxing and specialised facial treatments such as skin needling. You can also ‘craft your own journey’ choosing several body treatments from a list, totalling three hours. There’s shorter packages, a longer bridal one, and a full day, including lunch. I’m privileged to have manageress, Chavonne, as my therapist for all my treatments. In a class of her own, her thoroughness, care and intuitive know-how would make her sought-after at any of the world’s top resorts. She opens our five senses signature massage session with the liquid-like surging sounds of a rainstick ritual. Unique techniques using palms, fingers, and forearms are alternated with cool bamboo sticks and hot stones. I don’t know where my skin ends and hers begin, so lost in sensation am I. Completing the sensual experience are the soothing nature sounds of the wind, waves, and waterfalls, between the piano and didgeridoo. Stretched watercolours of land and seascapes in the colours of nature adorn the walls, adding a tranquil element. “In our treatments, we encapsulate all five senses to imitate our surroundings,” summarises their brochure well. Between my massage and facial, I’m too blissed-out to trek across the marble floor to the lounge area. Instead, I enjoy coffee and melt-in-the-mouth scones, cream and jam on the massage bed to the sublime sights and sounds of birdsong in the tree outside my window. Chavonne literally gets in my face for my signature fresh facial, which includes a neck and shoulder massage. “I like doing facials best as I like finding solutions for skin problems,” she said. I’d bet fresh’s treatments have resulted in many solutions, judging by the sense of well-being and glowing skin I leave with. 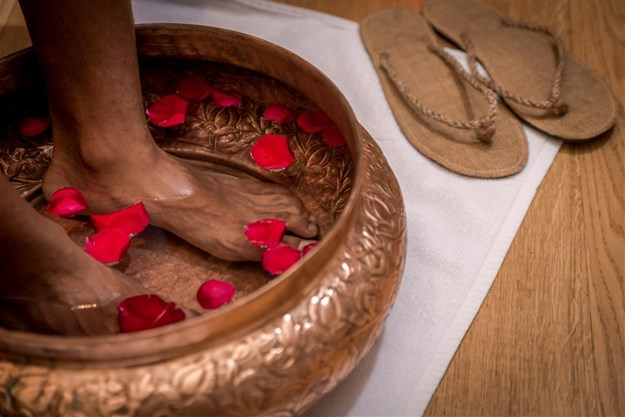 “At Jiva, we believe every client is a God,” said my therapist, Corenda, worshipping my feet clean in a fancy copper bowl of warm water. I’m seated on a plushly-upholstered armchair fit for royalty. 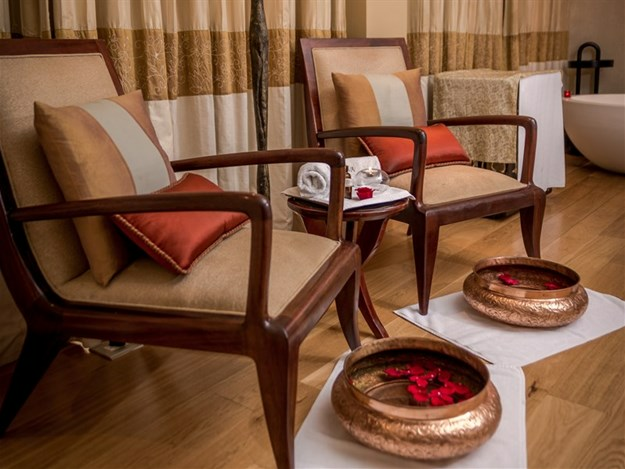 Indian body treatments at the Taj Hotel’s Jiva Spa make for an exotic experience. 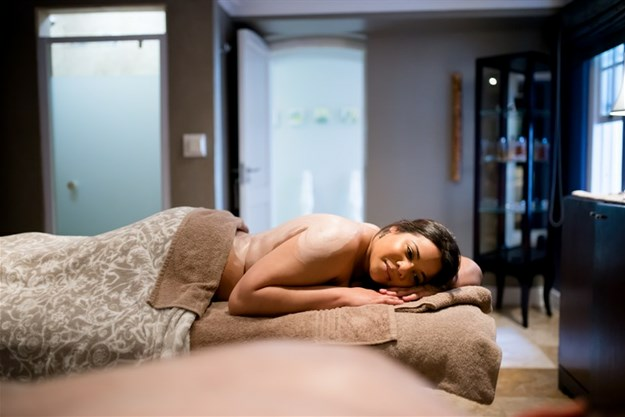 Popular signature treatments include the Shushupti – a ‘scrub and rub’ with Indian herbs, warm milk, and an aromatherapy massage. Nearly three hours long, the summer radiance special combines the spa’s best-loved treatments. Which almost 60 clients have enjoyed in the past month alone. 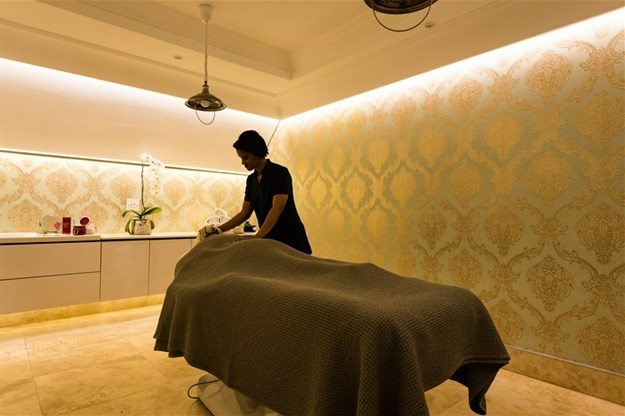 It includes a scrub, full body aromatherapy (using Vishrama Indian herb-filled hot pouches), a signature facial, and an Indian foot massage. I’m about to have my Phelwan massage on an underheated massage table to the musical score from the film, The English Patient. It’s 90 delicious minutes long and favoured by Indian wrestlers. Though wresting repels me and I’m far from the sporty type, a deep pressure, penetrating massage appeals. Strength is required to give a good Phelwan. Sometimes Corenda jumps on the massage table to more effectively pull up the back of my legs into a contortionist-type stretch or pull. At others, her masterful strokes include feather-light tickles up and down my spine. Unusually, even the face is massaged here. Finger point pressure is perfectly applied to relieve my troubled sinuses. When I begin snorting I know they’re being drained; treatment’s working. Up next is the Champi – an Indian head massage. I’ve had loads of these, but expectedly, this was the real authentic deal. Good for hair loss which I’m experiencing, Neem oil is used in the mix. Even my brain felt recharged after the invigorating finger-on-scalp workout. I had Indian tea over my pedicure; my legs calve-deep in a warm, bubbling foot spa. Concurrently, my back and behind are being electronically kneaded by the massage armchair’s programmes. My eyes are closed. I’m zoned out in an anonymous tropical paradise between sounds of bubbling waters and birdsong audio. Whether opting for a tailormade experience like mine or a regular package, prolong your experience by grabbing your favourite gals for a group giggle in the blue mosaic steam room. Like an Indian goddess, I’m adorned with a necklace on departure. The tulsi wooden beads have 107 joins - the number of the body’s weak spots, according to Ayurvedic medicine. A long-time globetrotter, Shellee-Kim spent seven years travelling through 43 countries.